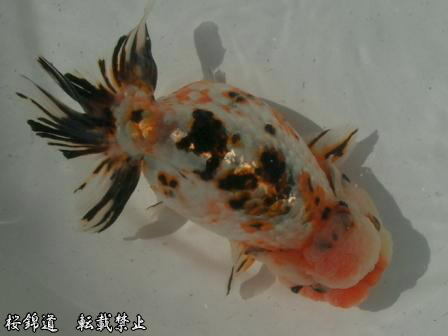 Background Yoshigoro Akiyama II made the Calico Ranchu by cross-breeding the Ranchu and the Calico Oranda in 1951. After that, further fixation was conducted and it was named the ‘Calico Ranchu’ in 1957. Since then, improvements on the Calico Ranchu took place at Tokyo Fisheries Laboratory by Heijiro Nagasawa and his team. Features The body shape of the Calico Ranchu is the same as the Ranchu, but without a dorsal fin. Its body pattern is also the same as the Ranchu, with red, white and pale blue transparent mosaic-like scales as its feature. The Calico Ranchu is not yet complete as a type of goldfish and there is much room for improvement. Normal. Acquisition of the Calico Ranchu itself is relatively easy. You are able to find it at places like home centers. While it is difficult to find Calico Ranchu in excellent condition, those of a higher quality have recently begun to be imported to Japan from China. Rearing difficulties Normal. In the same way as the Ranchu, there are no particular rearing difficulties for enjoyment purposes alone. Details of the above photo The Calico Ranchu in the picture is an adult from the Fushimi Fish Farm, located in Yatomi, Aichi Prefecture, which has the best reputation for Calico Ranchu in Japan. There are no defects in its body shape or lump on its head. It would be preferable if it was more pale blue in color, but it is the closest goldfish to the ideal Calico Ranchu. Other A derived type of the Calico Ranchu is the Kyonishiki, which has a longer tail.